How long should intervention ammunition last? After surprising the market in its two previous meetings, on the dovish side in March and on the hawkish side in May, we suspect the Brazilian central bank (BACEN) will try to avoid any surprises at next week’s policy meeting, in an effort to avert any further credibility damage to its policy guidance. As a result, we do not expect the bank’s decision and statement to diverge much from the bank’s current assessment that Brazil’s inflation outlook remains broadly benign and we are not calling for any adjustments in the policy rate in the foreseeable future. The SELIC rate should be kept stable, at 6.5%, on Wednesday, which contrasts with a local curve pricing of a 25bp hike. That benign inflation outlook should be partly countered by two recent factors: 1) the FX sell-off and 2) the truckers’ strike, which will trigger a near-term spike in inflation. Both of these have already contributed to (slightly) higher inflation expectations. Still, BACEN should be able to credibly forecast inflation very close to the target (4.5% in 2018 and 4.25% in 2019) and signal an implicit preference for a stable SELIC rate in coming months. The relatively comfortable inflation outlook reflects the below-target headline inflation rate, the considerable slack in labour markets and a slower-than-expected recovery in activity, with our 2018 GDP forecast now at 1.7%, versus consensus at 1.9%, and falling. Ultimately, however, we suspect the current monetary policy guidance underestimates the eventual need to tighten the SELIC rate, sooner than expected, in large part due to FX-related risks. Given that the hawkish surprise in last month's policy meeting was justified by the surge in external volatility (i.e. the weaker Brazilian real), any signalling on the rate front would be incomplete without an FX assumption. But central bank officials have strenuously downplayed any role FX dynamics may play in their rate policy decision process, while claiming a staunch commitment to a free-float FX regime. In our view, what bank officials seem to be suggesting is that: 1) recent BRL volatility was unjustified by Brazil’s fundamentals, notably the robust external accounts, and 2) therefore, the bank is prepared to deploy its accumulated ammunition (i.e. $380 billion in FX reserves) to correct the assumed misalignment and successfully stabilise the currency. In other words, faced with an external shock, FX intervention would be the first line of defence and, presumably, BACEN would only entertain rate hikes should FX intervention fail to stabilise the currency and prompt a deterioration in the inflation outlook. The implicit assumption is that any “excessive” depreciation in the real would be effectively contained through FX intervention. To that end, officials have committed to intervene directly in FX markets, using all the available resources to avoid excessive FX market volatility. We fundamentally disagree with the view that the recent BRL sell-off was unjustified. Yes, Brazil has a comfortable external account situation, which clearly sets it apart from the likes of Argentina and Turkey, which suffered particularly strong FX volatility recently, as seen in the chart below. But Brazil’s precarious fiscal accounts and the challenges any new administration would face to reverse its explosive debt trajectory also threaten the long-term health of its external financing accounts, and should justify great caution. In addition, the cost to implement FX hedges has fallen dramatically over the past couple of years, exacerbating the BRL’s vulnerability at this point. In our view, external and domestic factors played a role in the recent BRL sell-off. But regardless of how one explains it, it is hard to conclude that the sell-off was unjustified. It may have happened sooner than we expected, but that timing can be explained, in our opinion, by a sequence of unexpected events: 1) the surprisingly dovish monetary policy guidance announced in March, 2) the external shock initiated in April, driven by the rise in US yields and the stronger USD, and 3) the truckers' strike seen in May, which contributed to a more frontloaded pricing of the political/fiscal risk that would inevitably occur, in the coming months, if polls continue to show current voter preferences for the October race. 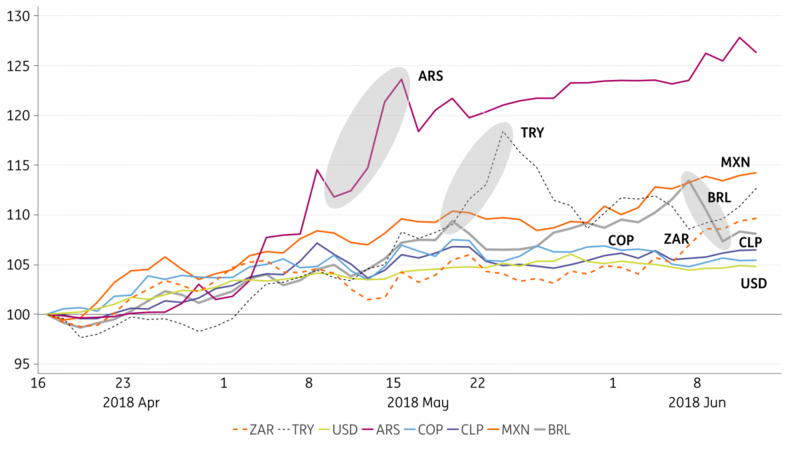 It’s also interesting to note (in the chart above) that even though the BRL sell-off was intense, it matched the sell-off seen in the Mexican peso and it paled in comparison to the shifts seen in the Argentine peso and the Turkish lira. Still, unlike the Mexican central bank, and like its Turkish and Argentinean counterparts, BACEN felt a need to react strongly to the currency weakness, perhaps calling into question the bank’s real commitment to free float. Going forward, we expect the BRL to retain a weakening bias amid prospects for continued demand for FX hedge in the context of heightened political and fiscal uncertainties. In particular, following the BRL rally seen in recent days, we believe political risks to be only partially incorporated into asset prices. 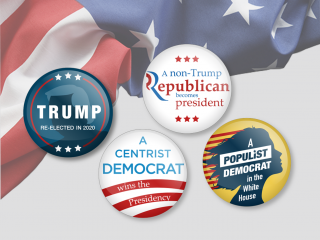 And so long as prospects for electing a market-friendly candidate in the October Presidential election remain dim, we consider the equilibrium level for the BRL to closer to 4-4.2, ahead of the race. As seen the chart above, FX intervention has been effective, at least temporarily, in altering the BRL trajectory. As a result, assessing the effectiveness of the FX intervention programme is critical to determine the likely path for the BRL. The primary FX intervention tool currently being deployed is the FX swap. This was the primary intervention tool used in 2013-15 as well (see the chart below). The advantages of using swaps are that 1) they match the main source of demand for USDs in the local market, which is the demand for FX hedges (instead of actual FX outflows), and 2) they do not affect the level of international reserves ($380 billion). Bank officials suggest that, in principle, they would not object to the use of FX reserves directly, to intervene in the spot market. But the depletion of FX reserves would damage Brazil’s otherwise robust external metrics, eroding the sovereign’s creditworthiness at a time when fiscal risks are surging, threatening further credit rating downgrades. As a result, despite BACEN’s professed willingness to sell FX reserves, we suspect the level of market dysfunction would have to be quite high to push policymakers to sell them. 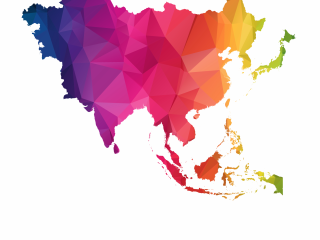 Regarding the FX swap programme, including the $20 billion in additional intervention announced last Thursday, BACEN has committed to provide about $30 billion in FX swaps this month, until Friday. Nothing yet has been announced for the second half of the month but, as seen in the chart below, the amount committed to the first half of the month already far surpasses any monthly intervention seen in the past ($18 billion, in June 2013). The record-high (heavy-handed?) pace of intervention should help to explain the considerable BRL outperformance seen since last Friday. In our view, instead of merely smoothing the currency’s trajectory towards a new equilibrium, the current intervention programme arguably may be just keeping the BRL at an artificially strong level. In our view, the intervention does not alter fundamentally the (external and domestic) factors that justified the BRL sell-off in the first place. Therefore, unless those factors change and become BRL-supportive, which seems unlikely to happen in the near term given that the most crucial concern involves fiscal initiatives that can only be properly addressed by the next administration, the intervention could be merely delaying the FX convergence towards its new equilibrium. In particular, the intervention has effectively created an opportunity for investors that are not yet hedged, to hedge at relatively more attractive levels. 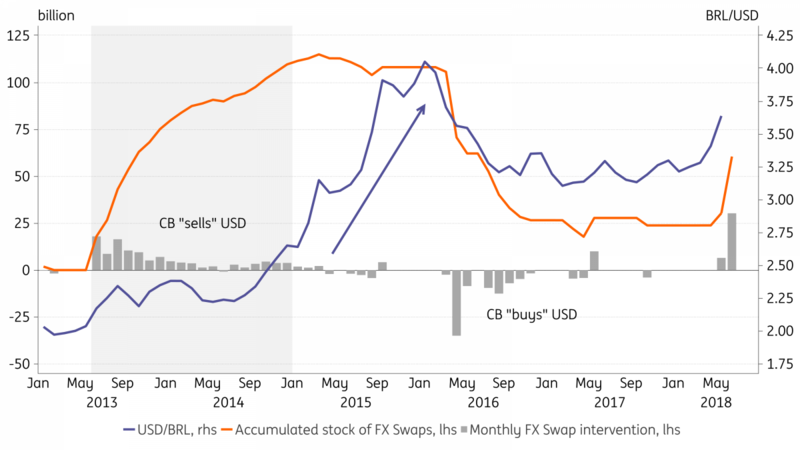 BACEN has committed to increasing its outstanding short-USD position in FX swaps to about $60 billion by Friday, about $55 billion shy of the $115 billion peak reached in March 2015 (as seen in the chart above). The maximum level of swaps BACEN can safely issue has become a matter of debate of late, given the explicit statement by governor Ilan Goldfajn that the bank would be willing to issue beyond that historical high. Much like the debate regarding the sale of FX reserves, the sale of FX swaps also carries some costs that must be considered. Even though the sale of FX swaps does not directly affect the level of reserves, the swaps are implicitly backed by those FX reserves. As a result, the larger the amount of FX swaps the central bank issues, the more the integrity of those reserves or, more specifically, the robustness of the insurance provided by those reserves is likely to be questioned. As a result, even though we agree that BACEN still has substantial ammunition to provide FX liquidity, the reality is that there’s a limit to how much officials will be able to effectively use that ammunition to counter FX weakness. Perhaps more crucially, in our opinion, the larger the accumulated stock of outstanding swaps, the less effective the intervention becomes as intervention compromises the health of Brazil’s external metrics, thereby justifying a higher risk premium. As the chart above illustrates, during the 2013-15 period, BACEN’s appetite (ability?) to intervene ended much sooner than the BRL’s weakening trajectory stabilised. In other words, intervention was effective, particularly in its initial stages, but it is a limited resource. And given the pace of intervention seen lately, which if maintained would reach the previous peak in less than two months, that resource could end (or become ineffective) much sooner than the four months until the October elections. BACEN has strongly asserted its unwillingness to hike rates in response to FX weakness. But, if we are right in expecting the bank’s intervention firepower to fizzle and the BRL to stabilise in the 4-4.2 range in the run-up to the elections, amid scepticism over a market-friendly electoral outcome, inflation expectations and the bank's own inflation forecasts (using reasonable assumptions for the FX pass-through) are bound to rise sufficiently for bank officials to start considering rate hikes. BACEN would frame any hike as an effort to anchor inflation expectations, which has become a critical indicator to monitor. But, ultimately, a hike would (indirectly) be a response to FX weakness, while playing a direct role in support of the BRL.